LINGOs, a learning consortium of 80+ international development, aid, and conservation organizations, and Principled Technologies, an award-winning provider of custom learning solutions and fact-based marketing, are excited to announce the release of several specialized elearning course templates for LINGOs members. Open University awarded Plan International its Learning at Work Day Award for Inspiring Learning. Sasha Smith holds the award at UK headquarters in December 2013. The Annual Learning at Work Day/Week is a wonderful opportunity to engage staff in learning, motivate them for further learning and promote the learning resources available to global staff. Plan International has successfully leveraged this event in the past, and will build on that experience – and its LINGOs membership – as it expands Learning at Work Day to Learning at Work WEEK May 19-25. The annual Learning at Work event encourages employers to organise a day of informal training sessions for employees to learn something they wouldn’t normally have the opportunity to do. Plan’s event was such a success that the team won the Open University Learning at Work Day Award for Inspiring Learning. The judges commented that were very impressed with Plan’s objective for the event, the partnership work and the promotion of further learning. Plan International’s 2013 Learning at Work Day was an opportunity for our team to highlight the fact we are an organisation that promotes and encourages staff to embrace learning within their role on a day-to-day basis. With so many employees with such a wide variety of skills and knowledge, the focus was on utilising the expertise of colleagues and the day proved to be hugely popular. Sessions and workshops ran throughout the day and included Spanish and Italian lessons, Microsoft Office training and help on how to make the most of social media among others. Plan began Learning at Work Day as a UK initiative, but after last year’s success the aim is to now get offices around the world involved. The team is already planning for Learning at Work Day 2014 and working hard to make sure that it isn’t just an International Headquarters initiative. To go global with the Learn at Work Week by encouraging our Regions to get involved as well as offering some IH sessions as webinars to include Plan’s global audience. The HR Operations and Learning & Development teams are creating a resource pack to equip both national and country offices with ideas, inspiration and resources to run their own Learning at Work Day. They are also planning to host webinars using Blackboard Collaborate to encourage participation from around the globe on a range of subjects, too. The teams are also incorporating social media by creating Plan’s very own Learning at Work Day Pinterest board, and using Yammer to spread the word across Plan. LINGOs is celebrating Learning at Work Week by hosting several virtual classroom events that may be of interest to the staff of any member organization. Click the buttons to learn more and register. Registration is free – but space is limited. Please share with your global teams! We’d love to have your learning champions, potential eLearners and mentors participate, engage, share and learn with us! Join LINGOs 2013 Rising Star Nick Walden of Opportunity International has he shares tips and insights from his organization’s highly successful program with Learning Champions. Join Jim Klaas of Dev Ed International as he shares some the lessons and approaches for helping learners prepare to be successful online learners. Jim willl describe the online learning readiness passport program developed for a global NGO, and what you can do to prepare for success. Join Janine Hackshaw as she presents Accion’s successful and popular mentoring program. What does it take to be a good mentor? How can your organization (or country offices) adopt it? She will discuss how to overcome the challenge of finding good mentors, and answer your questions to help you get started with your own mentoring program. 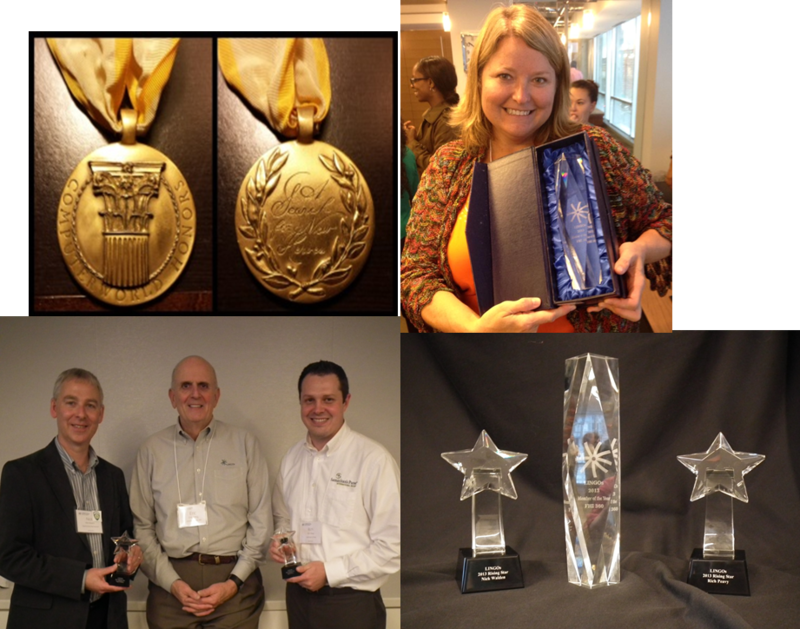 Clockwise from upper left: ComputerWorld Honors Medal; Paige Layno Winn with FHI 360’s Member of the Year Award; LINGOs Awards; Rising Stars Nick Walden (L) and Rich Peavy (R) with LINGOs CEO Eric Berg (Center). Among the fun and fabulousness at the LINGOs 2013 Member Meeting, we had the opportunity to recognize some rising stars and a member organization that is contributing above and beyond to the LINGOs learning consortium. Our Project Services group works with development organizations to build capacity in project management, and provides innovative learning opportunities for individuals around the world to strengthen their skills and knowledge. The Last Mile Learning initiative is providing world class learning at little or no cost – not just to our member organizations, but to ANYONE working to improve people’s lives in the developing world. LINGOs members have access to all that is available to others, often before it’s released to the public. The LINGOs 2013 member meeting was the ninth occasion at which LINGOs members have convened to network, share ideas and approaches and learn with and from one another. Over a third of our 76 member organizations from around the world sent representatives to the two-day event to take part in two dozen sessions hosted at PATH’s Washington, DC headquarters. It was a wonderful occasion, and at the reception hosted at the offices of the National Democratic Institute, we recognized some key contributors to our learning community. LINGOs recognized two individuals each one new to the community stood out as exemplifying the ideals on which LINGOs was formed. Both work with organizations that have joined LINGOs in the past two years, and each has contribute to the community in ways large and small – serve on advisory committees, share what they are learning – spotlights on work in progress, espresso shots, share questions and concerns in LinkedIn… provide and share across the community. LINGOs’ 2013 Member of the Year FHI 360 joined the LINGOs community three years ago, and has since undergone significant transition and growth. Paige Layno Winn, FHI 360 Senior Learning Officer and designated contact to LINGOs has played an extraordinary role and is more than a LINGOs star (maybe a sun). FHI 360 emulates the ideals of a learning community on which LINGOs was founded 9 years ago, and it is an honor to present the 2013 Member of the Year award to Paige Winn for FHI 360. FHI360 shared its initial learning and process for deploying its LMS with other members in a blog post in January 2011. This relatively simple way to share knowledge and approach to deploying technology based learning, has benefitted the many organizations that have joined LINGOs since then. In an early 2013 “Espresso shot” shared a great update on internal community building, that highlights use of resources they get through LINGOs and other low cost resource such as NING. FHI 360 is clearly is deploying LINGOs resources well, as can be seen from its learning management system utilization reports in terms of the total number of staff registered and actively engaging in and completing self-paced courses, as well as participating in events. Our Member of the year has tried out many member benefits, sometimes investing extra resources in getting more than what is available through LINGOs – such as we shared in the January Spotlight article. 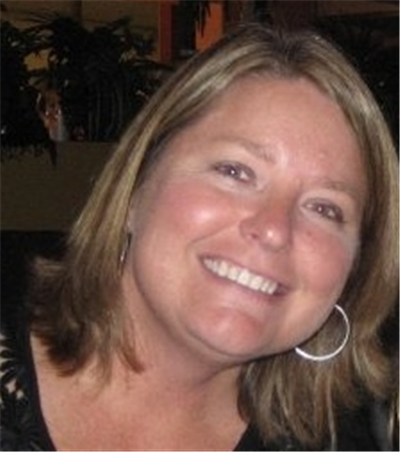 Paige Winn recently guest blogged on its approach to building a virtual community of learning. FHI 360 not only developed important resources through Global Giveback but shared with other LINGOs members, an award-winning resource that benefits any health worker working on HIV and TB prevention. Also through the Global Giveback, FHI 360 created a harassment and discrimination course that, with minimal adaptation, is now available for the entire LINGOs and InsideNGO community, has shared its approaches to using the LINGOs-hosted LMS for events and reporting. Earlier this year, in a LINGOs LINK Spotlight article, we reported that IDG’s Computerworld Honors Program named LINGOs as a 2013 Laureate for its collaboration with Rustici Software in the creation of SCORM Dispatch. The annual award program honors visionary applications of information technology promoting positive social, economic and educational change. Todd Slater, Director of the Technology Learning Center Director at The Nature Conservancy and LINGOs Board Member bestowed the ComputerWorld Honors Laureate medal on LINGOs’ Director of Technology, Robb Allen. Robb lead the work for LINGOs with Rustici Software that member organizations are now using to provide content from the LINGOs catalog to more than ten portals. Please view the Spotlight Report from the November 2013 LINGOs LINK. How do you create community in a virtual learning space? 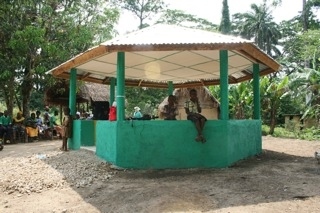 You might say that an NGO’s training classroom is like a Palava Hut—the organizational learning hub. So how do you create that same sense of community in a virtual learning space? The Learning and Development (L+D) team at FHI 360 has been working on creative ways to do just that. After each session, follow up discussions are posted on Café 360, a collaborative networking site we built using the professional social networking platform, Ning. 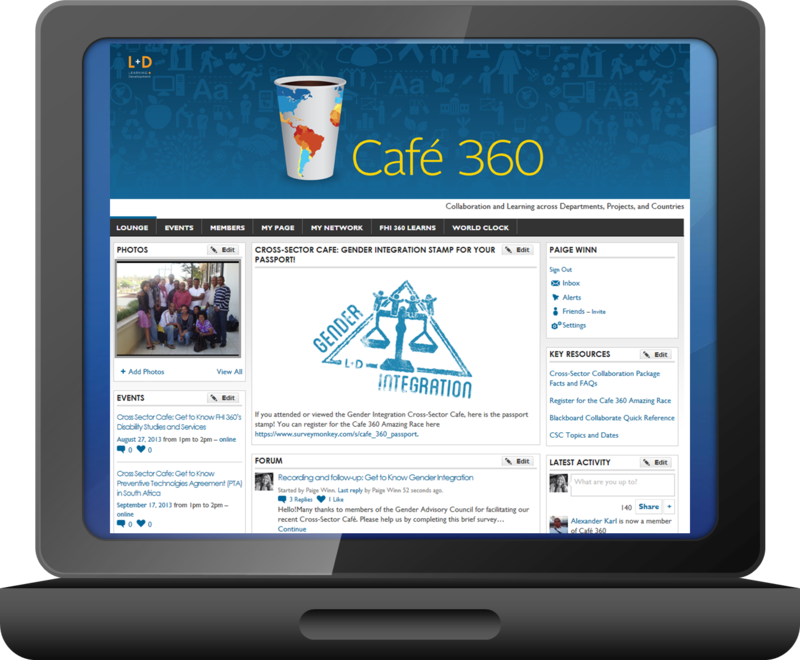 Café 360 is designed to promote cross-sector dialogue between staff through discussion boards, videos, and other cross-sector collaboration tools. Café 360 also provides us a place to post recorded Cross-Sector Cafés , so colleagues who couldn’t attend a synchronous session still have access. And, as a bonus, we have a nice library of virtual interactions between staff that can be accessed anywhere, anytime! Café 360 has been a great resource where staff share profiles and photos, as well as a place for L+D to post pictures of live, in-country learning events and learning materials. We’ve also set up content interest groups so staff can direct questions to the relevant people. For example, we have a learning champions group on Café 360 where champions can post LMS or eLearning-related questions and get quick responses—often real-time answers in their time zones. Another outcome of Café 360 is that others are now using technologies like Blackboard Collaborate to facilitate virtual learning across their own global teams. Groups are also seeing the advantage of adopting professional networking sites (such as Ning) and are exploring similar platforms for communities of practice and FHI 360 as a whole. As a result, learners are collaborating across geographies and practices areas, and staff are building their virtual training skills when they facilitate Cross-Sector Cafés. NGOs often face hurdles with expense, skill, and technology infrastructure. But with a growing variety of social media and mobile learning tools, you’re sure to find one that fits your budget, size, and capacity. In the spirit of a LINGOs Palava Hut, contact me if you’d like to talk about getting started with a virtual strategy to increase global collaboration and learning with your teams. Or better yet—let’s catch up over coffee at this year’s LINGOs member meeting! The LINGOs 2013 Member Meeting takes place October 16 & 17 in Washington, DC. Staff of all LINGOs Member Organizations are welcome to register and attend. Sessions are tailored for our members: to help you give your learners a “buzz”, help you use a mixture of resources to “blend” your program and give you ideas to make maximum use of the limited “bandwidth” we all have available – both figuratively and literally.